"On 17 June, we expelled two Russian officials from the United States to respond to this attack," Mr Kirby said on Friday. He said this was in response to the attack on the US diplomat on 6 June. The assault happened after the accredited American official had identified himself to the policeman, Mr Kirby said. "The action was unprovoked and it endangered the safety of our employee. The Russian claim that the policeman was protecting the embassy from an unidentified individual is simply untrue." 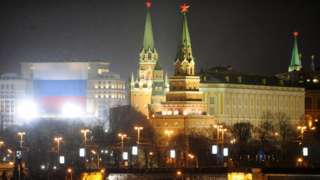 Russia said earlier this week that the US official was a CIA agent who had refused to provide his identification papers and hit the policeman in the face. "Instead of the CIA employee, who was in disguise, as we understand, it could have been anyone - a terrorist, an extremist, a suicide bomber," Russian foreign ministry spokeswoman Maria Zakharova said. between the US diplomat and the Russian policeman. Last month, the US said it had raised the issue of the alleged harassment of US diplomats in Russia directly with President Vladimir Putin. Washington said the problems began two years ago after the US - as well as the EU - imposed sanctions against Russia over its annexation of Ukraine's southern Crimea peninsula and its ongoing involvement in the conflict in eastern Ukraine. Specific incidents have not officially been revealed. But the Washington Post said last month they included breaking into the homes of embassy staff, rearranging furniture and even killing a family pet. No official response has been made by Russia but a statement to the Post did not deny the charge and said there had been US provocation against Russian diplomats. The former US ambassador to Russia, Michael McFaul, told the newspaper that while his family was living in Moscow, they were routinely followed by security services that wanted him to know they were being watched.